Today’s modern white filling materials strengthen teeth unlike the mercury amalgam fillings of years past. These new materials restore teeth to their original look, feel, and beauty. Laugh again with confidence. I don’t like the way my metal fillings look, do have any other options? 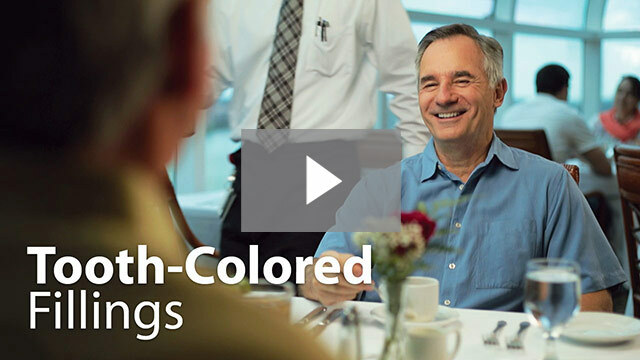 Many dental patients are switching over to natural tooth-colored fillings. White fillings can either be composite or ceramic. Both options look and feel the same as your natural teeth. Composite restorations are a very common material used for fillings. Composite restorations are the most often used material to replace metallic fillings, and are quickly becoming one of the most commonly used materials in cosmetic dentistry. Cosmetic restorations are used to close gaps in the teeth, to fix and repair chips, gaps, and cracks in the teeth, as well as restoring the size or color of a tooth. How are composite restorations placed? A composite restoration can be placed in just one visit. We numb the adjacent area, remove the decay/old filling with a handpiece and bond, place and cure the filling material, then adjust the bite and polish.